Koushun Takami's notorious high-octane thriller envisions a nightmare scenario: a class of junior high school students is taken to a deserted island where, as part of a ruthless authoritarian program, they are provided arms and forced to kill until only one survivor is left standing. Criticized as violent exploitation when first published in Japan—where it became a runaway best seller—Battle Royale is a Lord of the Flies for the 21st century, a potent allegory of what it means to be young and (barely) alive in a dog-eat-dog world. A new translation by Nathan Collins. Koushun Takami was born in 1969 in Amagasaki near Osaka and grew up in Kagawa Prefecture of Shikoku, where he currently resides. After graduating from Osaka University with a degree in literature, he dropped out of Nihon University's liberal arts correspondence program. From 1991 to 1996, he worked for the prefectural news company Shikoku Shihnbun, reporting on various fields including politics, police reports, and economics. Although he has an English teaching certificate, he has yet to visit the United States. Battle Royale, completed after Takami left the news company, was rejected in the final round of a literary competition sponsored by a major publisher due to the critical controversy it provoked among jury members. 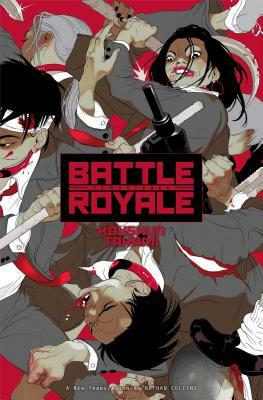 With its publication in Japan in 1999, though, Battle Royale received widespread support, particularly from young readers, and became a bestseller. In 2000, Battle Royale was serialized as a comic and made into a feature film.Mr. Takami is currently working on his second novel."